Goldfish overcrowding (also called "goldfish overstocking") is a serious cause of goldfish dying prematurely or them having stunted growth. I find it's helpful to use the analogy of your own house. Imagine you doubled the number of people living there. And then you couldn't clean it for several days. What would it be like? How would you react to that? Oh yes, you can't open the windows or doors either. You are stuck with the same amount of oxygen in there as before. How would it feel? Now imagine your goldfish. They are in a man-made artificially-constrained space (an aquarium). They are swimming in a limited amount of water and, like babies, they eat and excrete. But unlike babies, they can't cry and be heard if they are in distress. Many people assume that when they go to a pet store and see fifty small goldfish in an aquarium that it means it is OK to buy a whole bunch of goldfish. And then keep them in one small tank at home. My rule of thumb: a 54-liter tank for a maximum of 2 average-size goldfish. The larger the aquarium, the better. You can never have an aquarium that is too big. So why is overcrowding such a hazard for your goldfish? Here are a common mistake goldfish keepers make: just because the aquarium water looks clear does not mean it is clean or healthy for your goldfish. When a fish suffers from ammonia or nitrate poisoning, then what's happening is that the concentration of ammonia (a clear colorless liquid) is becoming higher. The water looks clear, but it is actually poisonous. You can only be sure it is safe by using an ammonia testing kit - and conducting regular water changes. Goldfish actually experience chemical changes under stressful conditions. They are designed to release growth-stunting hormones in hostile environments. And you don't want to be unintentionally creating a "hostile" environment in your aquarium - by having too many fish. 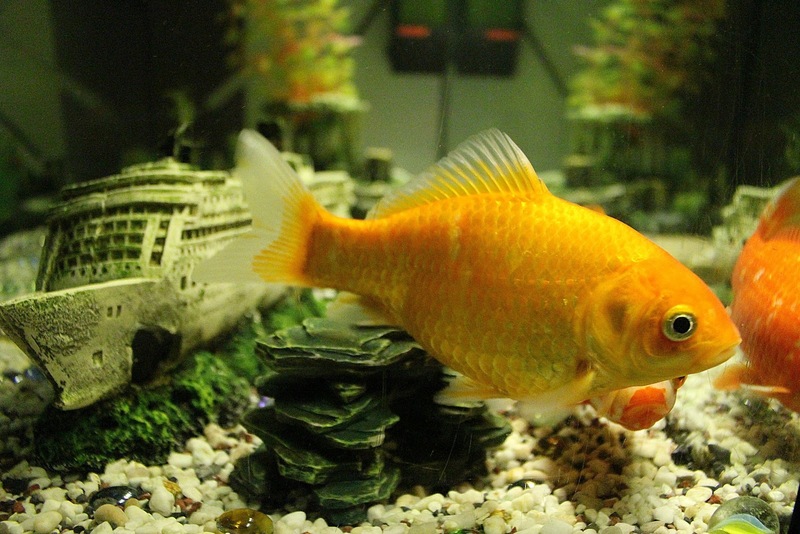 In the worst cases, goldfish get so big they can't physically turn around in an aquarium. They get stuck in the same position. They can't feed properly and become distressed. Finally, your goldfish need plenty of space to move, swim and play. You can't expect them to be happy if you don't give them the room to move about. It'll be a lot more enjoyable for you to watch them moving gracefully. It gives them the chance to engage in a normal range of healthy behaviors. These are fascinating to observe (and watching goldfish is proven to bring your blood pressure down too). Life is fast-paced. It is nice to actually stop and 'smell the roses' as the old saying goes. So busy rushing the children off to school, off to work, after-school activities, soccer, dancing, piano lessons homework, dinner, bath, bed. Does that routine sound familiar? Many of us are living a whirlwind with no time to just stop for a moment, take stock and look at what is really wonderful in this world. I've found a little time spent relaxing, sitting together with the children, just watching our goldfish each day rewarding. I want the children to grow up understanding commitment. Trends and fads can easily take over every part of our lives, from the groceries we buy, the clothes we wear to the home we live in. The term 'disposable society' creeps into our vocabulary all too frequently. Our young children have the job of feeding our goldfish. The feeding ritual itself is a lesson for children. Not only the commitment to feeding the fish daily, but they learn that variety is important to the health of the fish. Even goldfish need their fruit and vegetables. A little zucchini and peas help to keep their bodies healthy, just like ours. Reinforcing the message of the importance of good nutrition. They help with the weekly task of cleaning the fish tank. Being diligent with aquarium care and keeping the tank clean is vitally important to the health of the fish. I love the deeper lessons our children are learning from taking care of their fish. Unlike cats & dogs these pets can't go to the door when they need to go outside or want to go for a walk. Goldfish are completely reliant on our diligence for their needs. If we let them down we possibly cut their lives short. Their lives are completely dependent on our care. The great thing about goldfish is that they are relatively hardy, particularly the comet breed. These fish are very lively and add great color to the tank. The tails of the comet are 3/4 the length of the body of the fish and so look magnificent when added to an aquarium. Overcoming society's 'disposable' attitude can be difficult. Children are conditioned from a very early age to 'throw away' things that are used, or imperfect. All too often a goldfish meets an untimely end and is disposed of down the toilet. With diligence, attention and a little knowledge, this can often be avoided. With care, we can nurse your pet back to health. A small hospital tank can be set up to isolate and treat the sick fish. It's a rewarding experience to see the fish recover and go back to his home with the other fish. We go to the computer and research together. Setting up a breeding tank, learning and watching the cycle of life is another important lesson in caring and nurturing. Keeping goldfish is a way of installing a caring attitude to nature. The lessons for our children are invaluable: commitment, responsibility, nature's life cycle and the importance of caring for life. Apart from providing a wonderful addition to our home, these fish give our family so much more than the meager attention and care needed for their survival. There you'll find information to help in choosing aquariums, food, and necessities for your aquarium. You'll learn about types of goldfish and how to identify goldfish illnesses as well as treatments. All the information and resources necessary to keep your fish healthy. Have you ever discouraged yourself from owning pet goldfish because of what other previous goldfish owners have said about them, particularly the negatives? Well, you shouldn't; especially if you can't vouch for the truth on why their goldfish originally died! Perhaps the owner tried to keep the fish in a bowl, after partaking in the TV show myth of happy goldfish swimming in an adorable round bowl. Or, maybe the environment was not a bowl, but it was still confining; depending on how many goldfish the owner was keeping at a time (Goldfish need to swim in schools-that applies to just about every type of fish known to man-except "Siamese fighting fish" or Bettas). The first is the beautiful colors and patterns. Many out there you will find are not completely "orange". They have patterns of golden yellow, black, and white mixed in. The fancier the goldfish (such as fantails and moors) the more varied these patterns will be, but even common goldfish can be striking, too. One of mine is two-toned in white and orange. You will also find that goldfish are friendly, intelligent, alert (you will never forget to feed them as they will be greeting you at the glass as soon as it's time!) And they subsist on a fairly varied diet..pellets and flakes are good, but they've been known to enjoy spinach and shelled peas, brine shrimp and bloodworms. If you like live aquarium plants, I would refrain from keeping them around goldfish as they will nibble on them too. You will also find that goldfish are hardy and long-lived (Japanese koi live even longer-some up to 20 years or more!) I've had the same orange and white pet goldfish for going on three years so I can tell you they are pretty tough. They are not completely immune-there are a few goldfish diseases like ick and swimbladder that definitely require attention and solitary quarantining. A goldfish lifespan depends on different things-but do not underestimate the "key points" which I will talk about in the next paragraph. The first point is their habitat. Yes, absolutely, 100 percent. You NEED to keep them in a tank... NOT a bowl. I would strongly advise you against purchasing one of those "mini" or "nano" tank kits if you plan on keeping goldfish-save those for your solitary Bettas in the future. The tank needs to be fairly roomy-doesn't have to be gigantic (in such a case, you'd be better off keeping them in a backyard garden pond, where they will thrive in large numbers.) Many experts will tell you that you will need a 30 gallon tank at least. If you own a 29 gallon capacity tank; no big deal here as that's just one gallon off. There are friendly "natural" tank-cleaners like pleckos and Chinese algae eaters that can give your tank a little cleaning boost. The reason for this larger size is that a bigger tank will keep the water pollution issue to a minimum. Goldfish waste levels definitely exceed that of other freshwater varieties. The smaller the tank, the more frequently the water will need to be changed. You also need a good filtration system and an air pump. A heater for the aquarium will not be a necessity as goldfish are not as temperature sensitive as some other freshwater fish breeds. Bi-monthly (every other week) water changes are important; the first time you may want to siphon about 25% of the water, the next time and subsequent changes, about half of the water should be good. Now if you are thinking of just pouring that dirty fish water down the drain, take a tip from my brother-in-law who has raised goldfish longer than I have. The bacteria present in fish waste laden water will make great plant fertilizer if you have a garden in progress. Even for a few houseplants, the soil will get a much-needed boost. When you replace the removed water with clean (chlorine-free; no instant from the tap kind of water) be sure to also change the filter cartridge as well. You should (and will) enjoy your pet goldfish for a long time to come if you remember all the important points made earlier. Goldfish are attractive, not difficult to care for, and quite inexpensive (depending on whether you are looking at common or fancy varieties.) Four "common" goldfish from a pet store retailer set me back only a dollar. "Fancy" goldfish start at a dollar apiece and up from there depending on the type. They will pay you back in dividends as you see how big these little guys will get eventually! I have a four-incher that you would never guess was once two inches long so I hope it doesn't get any bigger. I consider this particular goldfish the "alpha male" or the "Queen Bee" of my bunch. If you ever want to take this hobby to the next level one day, you might want to look into garden fish ponds. A lot of work goes into crafting the dream backyard goldfish pond-much more than tank-keeping-so keep that in mind. Until then though, I hope you will get the maximum benefit from raising your goldfish to be happy and healthy in a nice home aquarium! 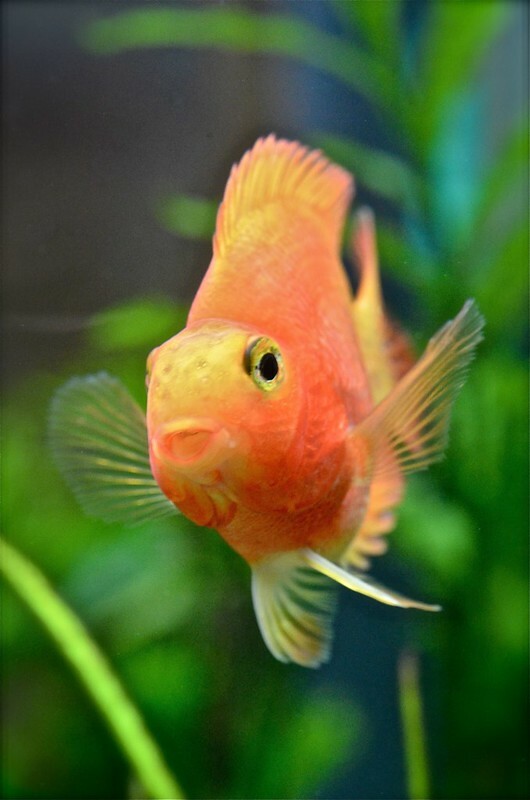 If you would like to learn more about goldfish and other helpful information on fishkeeping in general: Pet Goldfish be sure to visit Jennifer's Animal World for more information! Goldfish is a very popular pet among the young children as well as adults. It is a favorite pet of many people as each has a different personality and can be easily trained to do different tricks. Goldfish was the first fish that was used as a pet and is the most commonly found pet fish all over. Goldfish belong to carp family. There are many species found due to selective breeding. The specie varies in traits, colour, fin, tail shapes, eyes, body shape etc but all look visually pleasing and lovely. Shubunkins are found in two different forms; London Shubunkins and Bristol Shubunkins. Theses fish show calico colours like yellow, red, orange, violet etc. It can be identified because of small black spots on its body. Shubunkins goldfish appears to be scale less and look very much like the common goldfish. Comets Goldfish is the common goldfish found as a pet. Comets Goldfish have high tolerance for low temperature and low water. They can grow up to fifteen inches in length. They are very active and can have a life of up to thirty years. Comets Goldfish can be identified due to their small slim body and long tails. It is found in a range of colors like orange and black, red and white, red and black and orange and red etc. Oranda Goldfish have a characteristic head helmet and long split fins and tail. The true Oranda is rare and hard to find. It can grow up to five inches in length. Oranda Goldfish has an average life of sixteen years. This type of goldfish is found in blue, red, brown, yellow and black colors. Ryukin Goldfish have a small hump at the back of their head. These fish can grow up to six inches in length and have an average life of fifteen years. 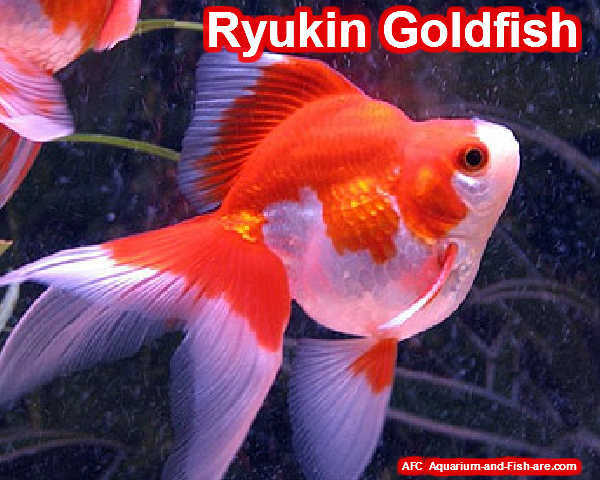 Ryukin Goldfish is found in calico colour combinations like white and orange and red and white etc. Pearlscale Goldfish is also known as Chinshurin. This fish has scales that appear to be raised from the body. Pearlscale Goldfish is found in a range of colours. It has a round shape and has feature that make it look like a pearl. This type of goldfish is sensitive to temperature and water changes. 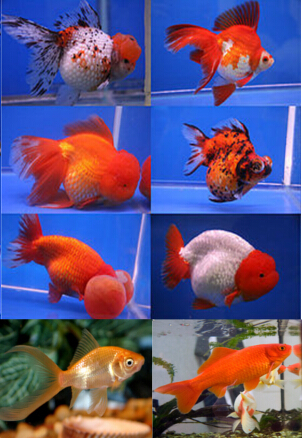 Pearlscale Goldfish is found in different shiny colour combinations of yellow orange, brown, red orange. The colours can be in patches or on a blue background color. Telescope Goldfish is a commonly found goldfish. It is found in a variety of colours and shapes. The true Telescope Goldfish has very long fins. Black Moors goldfish is an active and easy to train fish. It has an average life of seventeen years. This type of fish is only found in deep black colour. It is found in groups and is comfortable with other types of goldfish as well. Veiltail goldfish has different variants and is found with different adaptations like Philadelphia veiltails, European veiltails and Chinese veiltails. They have a delicate body and need a lot of care. 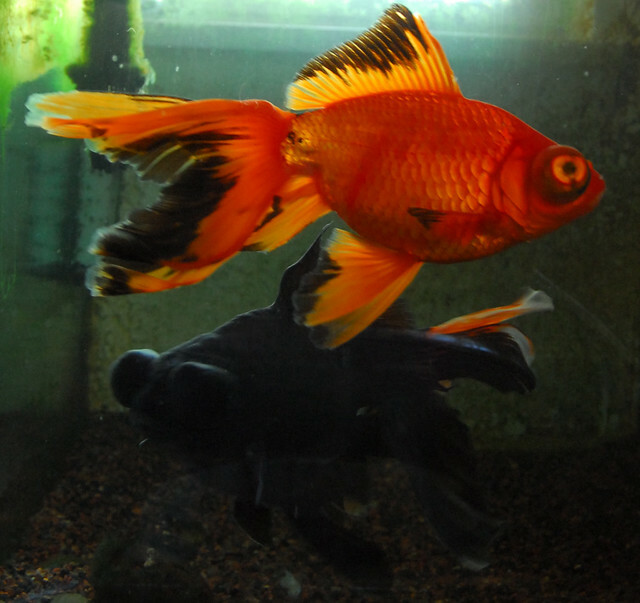 Veiltail goldfish is available in different colours and has long fins. 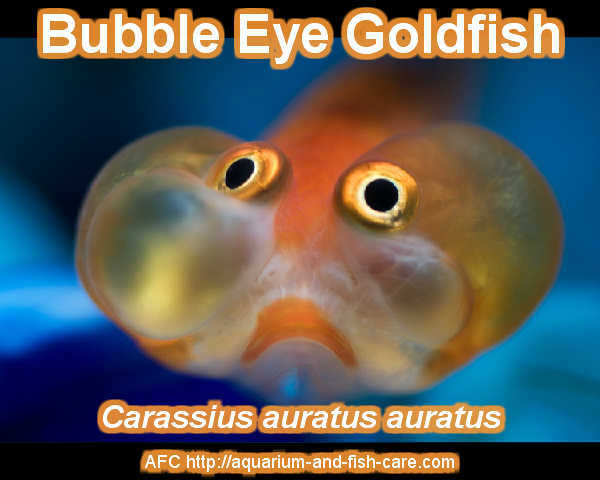 Bubble Eye Goldfish has large bulging eyes and large delicate sacks blow the eyes. Bubble Eye Goldfish is found in black and orange colour and is without dorsal fins. Phoenix Egg fish/Egg Goldfish is a very rare type of goldfish and not found easily. It has long fins but no dorsal fins. Lionhead Goldfish has a straight back behind a large head. It is poor swimmer and is comfortable with other poor swimmer goldfish. It has a round body and is found in colours like yellow, orange, blue and black. Matt Kepnes has been learning and writing about Goldfish since he had his very own as a young child. When you really take the time to look at it, the majority of common goldfish sickness problems stem from one thing: poor water quality. Fortunately, it's as easy to get this right as it is wrong. Some goldfish problems related to water should never happen. For instance, a goldfish should never be kept in a bowl. Why? Simply because it's too small: too small for proper surface exchange of gases; too small to allow enough water to circulate and keep oxygen content high enough. Did you know that in the United Kingdom, the government was forced to introduce legislation to protect goldfish? The reason was that they were often kept in small bags at fun fairs. Cramped inside, goldfish would routinely suffocate from lack of oxygen and inappropriate conditions. How are your goldfish going to get all the oxygen they need? From experience, even a small goldfish requires at least 20 litres of water. That's just a teeny tiny goldfish! And you know something? They grow - fast. Second, you absolutely must have a working filter and pump. And these need to be turned on 24/7. If you turn the pump off, the water won't be pushed to the surface and oxygen transfer can't happen. This is a good reason to ensure that you never keep an aquarium in a bedroom - not even for the kids. If you do, children often find it affects their sleep. That's the point where parents sometimes turn the pump off at night. It's far better to keep your goldfish somewhere you can leave the pump and filter running, so they can do their work. And you won't be disturbed at night time. What happens if you don't have the right oxygen levels for quality goldfish water? Answer: Your goldfish will choke. You can tell if a goldfish is struggling to get adequate oxygen because they will spend a lot of time at the surface, gulping away. You can literally see them suffocating. And immediate action is essential: either buy a larger aquarium; get a pump installed; or do an immediate water change. If you have a new tank and you notice that the goldfish water is cloudy, then that's just a sign that it's beginning the "cycling" process. This is natural and will settle down after a few days. Here's the bottom line: if you don't change water regularly, your goldfish will suffer. You need a regular (weekly) maintenance schedule for any aquarium. The minimum requirement is to change 20% of water every single week. I usually change 40% of the goldfish aquarium water. And I have had healthy goldfish as long as I can remember. There are times in every parent's life when his or her child, pet, or goldfish gets sick. Goldfish are prone to many ailments, and even the most common ones can be life threatening. Prevention and monitoring your fish are the best ways to keep your pet from contracting a disease. Being the good parent that you are, you have probably studied and memorized the normal movements and behaviors of your goldfish. If Goldie happens to become ill, look for signs that differ for their normal swimming patterns. If your fish is shaking, hiding in corners and isolated places, gasping for breath near the surface of the tank, has his fins pressed together in a clamped fashion or demonstrates any other strange behaviors, it might be a good indicator that he's coming down with an illness. Once you've noticed these odd actions, take a closer look at your fish and see if there are discolorations or markings on his body. Fish with certain parasites might have red and inflamed areas, sometimes around the gills, or might have swollen blood bumps on eir bodies. Check for damaged fins, cloudy eyes and bumps or blisters that appear on the scales. There are many common goldfish ailments that can be identified by examining your pet's physical appearance. Once you have identified that there is definitely something wrong with your goldfish, it is a good idea to isolate him from your other fish in a hospital tank. The hospital tank is prepared in advance and made to match the current environment of your fish, so that he won't go into shock. If the ailment turns out to be contagious, it's not a bad idea to treat your other fish as well as the sick one. Unfortunately, some fish, no matter how hard you try, do not overcome their illness and continue to suffer until they pass away. Many people do not like to see their fish in constant pain and fell that euthanasia is appropriate. There are many methods out there for ending the life of a goldfish, so be sure to choose one that does not cause your fish even more pain. While there are plenty of goldfish illnesses, there are just as many ways to treat them. Prevention and care is the best medicine for keeping your goldfish buddy in tiptop shape. For many people, goldfish are one of the first pets that they have as pets. This species is one of the most well know types of fish, and breeders can be found all over the world. The origins of keeping goldfish as pets dates back a thousand years to ancient China, where the hobby of keeping goldfish was at one point controlled by the ruling imperial family. Fish have been domesticated in China for thousands of years. As early as the Jin Dynasty (265-420AD), carp, a relative and ancestor of modern day goldfish, were kept and bred. Beginning in the Song Dynasty (960-1279AD) however, goldfish as we know them now were initially developed and bred. By separating the orange, red and yellow color variations in domesticated carp, breeders could reliably develop the breed further. Early on, the imperial family prohibited anyone outside of the palace from owning yellow (gold) goldfish, because it was the imperial color. In the palace, however, there were numerous ornate ponds full of these beautifully colored fish. Later, in the Ming Dynasty (1368-1644AD), the continued development of the goldfish species led to more color variations as well as the first recorded instance of a fancy-tailed goldfish. Eventually, the practice of keeping goldfish grew from China and began spreading around the world. Japan was introduced to the goldfish in 1603 where the hobby quickly became quite popular. It was here during this time period that the Tosakin and Ryukin goldfish were developed. Just a few years after goldfish were introduced to Japan, they also made their way to Europe. In 1611, the first recorded instance of goldfish was noted in Portugal, and from there the species spread all throughout the continent. Today, goldfish come in all types of breeds and color. The species has come a long way from its ancient origins, and now has developed into a popular hobby for goldfish keepers all around the world. No matter whether you just got your fish goldfish, or you have been keeping and breeding them for years, there is no doubt that you can see why this species of fish has been popular for a millennium. For the best goldfish care information, please visit our web site at my profile.